Located in a quiet street only 50 metres from the safe swimming North Waikanae Beach. Cafe's, Tennis Court, Shops and Golf Course are 15 minutes walk away. The house has everything you will need for a great stay, enjoy the indoor outdoor flow, onto one of the three decks. Downstairs is a large Kitchen, Dining area, Lounge, Bathroom with Double Shower, Bedroom with internal access to the bathroom. Wood Burner to keep the house warm during the colder months. For people who are mobility bound, there is ramped access to the house, and the mentioned facilities downstairs. Upstairs are three bedrooms, bathroom and seperate toilet. Two of the Bedrooms have views of the sea and Kapiti Island. 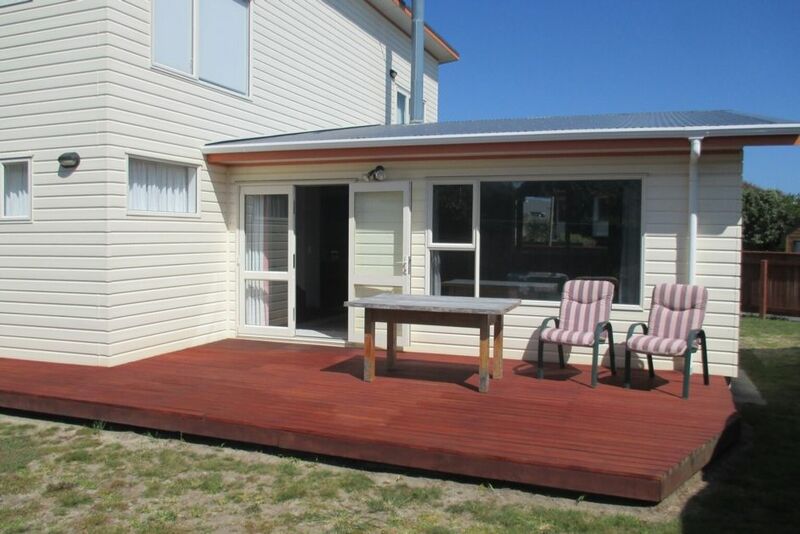 Off the Main Bedroom, is a large deck from which to enjoy watching the sun going down. For Babies and Tots, we have toys, baby bath, High Chair, Cot and a Buggy (Please let us know if you require these in advance). toilet, shower, Downstairs BathRoom - with Large Double Shower. The floor is level with the back deck, and this has a small ramp. We loved staying at Edwin's place in Waikanae beach. The home was large and clean, with plenty of space. The location was top-notch, with access to the beach just across the road. Great stay in house which was spacious and had everything you need, short walk to beach across the road, would definitely stay again. Really enjoyed our stay, close to beach, good outdoor space, and good size rooms. Would stay again. Great place to stay. Plenty of room, amazing fire and great kitchen. We spent Easter at this very spacious house with family for a birthday celebration. We spent Easter at this very spacious house with family for a birthday celebration. It is a very comfortable house with all conveniences, an excellent location to the beach and easy walking distance to cafes. Excellent location for beach access. Excellent location for beach access. Property spacious with plenty of room for a family of 7. Good to have efficient dishmaster and washing machine and good wi fi. Could have done with a few more kitchen bowls for salad making etc. Linen a little worn.